While I was in LA last weekend, I was treated to not only a luxurious time at The Langham Hotel, I also got to see the DVD premiere of Beverly Hills Chihuahua 3. I have not seen the first two so I had nothing to compare it to but it turned out to be a cute movie, all the dogs in the adorable costumes, and the one-liners that made the whole room laugh. Then once I made it back home, my five-year old had to watch it that same night. He loves dogs so this was right up his alley. While he knows dogs don’t really talk, he found it amusing them doing just so. His favorite part was watching the “dog bands”, audition for Rosa’s quinceanera. 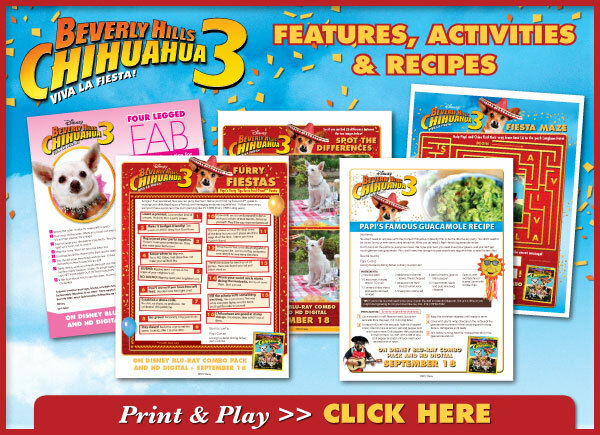 In addition to the all-new feature film, “Beverly Hills Chihuahua 3” comes with a tail-wagging array of bonus features, including bloopers and an all-new music video. While I was at the Press Release for Beverly Hills Chihuahua 3 I actually got to sit down for a Q & A session with the Director, Producer and Dog Trainers. Look for that post later to come! You can read my post, The Langham Doggie Program at The Langham Pasadena and see what my stay at the Langham was like though! Q: THIS IS YOUR THIRD “BEVERLY HILLS CHIHUAHUA” FILM. TELL US HOW YOU BECAME INVOLVED IN THE FRANCHISE. GL: I’ve never been part of a trilogy before. I didn’t make the cut on “Twilight.” But “Beverly Hills Chihuahua” is a passion for me now. I’d never done ADR before the first one and the first part wasn’t really that big. Raja Gosnell (director) gave me some lines and I ad-libbed a few more lines and then the part began to grow and grow and then it became the drive of the movie. And now these other characters have come in, but Papi is the Beverly Hills Chihuahua. Chloe is Chloe, but Papi drives the franchise, which is nice. I really enjoy it. I’m happy to be associated with it, that’s why I’m back for the third one. I love it. Q. WOULD YOU PLEASE GIVE US A GENERAL OVERVIEW OF THE STORY FROM PAPI’S POINT OF VIEW? GL: He started out single, and then he married Chloe and became a dad. He’s trying to be a good parent to his puppies, who are very modern and his ways are kind of old ways but they still work for him—in theory. But the kids go to a private school and they learn things in a very safe way and he’s trying to teach them precautionary lessons—and lessons about staying focused and centered and the history and the ancestry of a Chihuahua, which I think any parent would want to instill in their kids. His kids don’t want to hear it, but it’s still not a bad lesson to teach. Q. PAPI IS SUCH A GOOD DAD. WOULD YOU TELL US WHY THAT IS, ESPECIALLY HIS RELATIONSHIP WITH ROSA? GL: He’s a very passionate individual. In the first movie when he fell in love, he was as romantic as anybody had ever been, human or canine. People would ask me, are you really that romantic? When I saw the movie the first time I couldn’t believe that I was that romantic. He’s passionate about his kids. He loves, loves, loves his kids. Rosa is the smallest one, the youngest one, the baby, so you could see that there’s obviously a connection with the baby. She hasn’t progressed as much, is not as mature as the others who can go out on their own, so he guards Rosa and shelters her and they share some very nice moments. Q. WOULD YOU PLEASE DESCRIBE PAPI’S PERSONALITY AND HOW HE HAS EVOLVED OVER THE THREE FILMS? GL: Papi started out very loyal to Sam. He’d do anything for Sam. He says, “Come on Sam, let’s do this and let’s go here and let’s do that.” Then, when Chloe got lost he was like, “I’ve got to find Chloe!” He was in love and passionate. And then he had the kids and wanted to make sure that he didn’t overprotect them. But you have to let them grow and like any journey that any father would go through about getting married and having children and being passionate about the kids is they have to stand on their own. And I think sometimes parents have a hard time letting go at different levels of a child’s life. They eventually have to stand on their own four paws. GL: I just like his personality. I hear Papi a lot in my normal conversations. I love the voice. It allows me to be very passionate and over the top and funny and connected and wild in a dog form. I think it’s almost like what kids feel when they play video games and they get to hide behind a character. I’ve been able to navigate and negotiate this dog through three movies and it has never been boring. I was finding my way as Papi in “Beverly Hills Chihuahua” and in the second one. But for the third movie I really get to hear the voice mature and become very strong in this movie. Q. IS IT MORE OF A CHALLENGE TO DO VOICE-OVER WORK THAN YOUR ON-CAMERA CHARACTERS? GL: Yeah, you have to capture the character entirely in the voice. I like the fact that they tape the performance when you’re doing it. They tape it so they can get a little bit of your mannerisms and try to give the dog a little bit of flavor. When I saw the dog for the first time, the dog that plays Papi, he was a rescue. They showed me a picture of him and he stood so regal. He thinks he’s a big dog. And the way he stood, I understood him. I saw in that dog someone strong and forward and passionate and loving. Being around him was nice. Q: ALTHOUGH THIS IS YOUR THIRD “BEVERLY HILLS CHIHUAHUA” FILM, IS IT STILL FUN FOR YOU TO SEE THE FINAL PRODUCT AND TO HEAR YOUR VOICE COMING THROUGH PAPI? Gl: I’m more excited. I’m excited about every one of them, but this one really has a great story. There are so many new characters and there’s the little mini Doberman and mariachis, which I think are hilarious every time I see them. It has a more constant flow comedically, and a great story through the whole film. So I think when you make movies like this, the kids love the movie and they’ve loved the other two, but the parents do too. People say they forget that they’re watching dogs. They’re looking at them like actors. You’re rooting for a dog that makes you feel they’re actors. An email address is required to enter. The winner will be chosen randomly through Rafflecopter and contacted via email. A reply to the winning email is required within 48 hours before a new winner is chosen. One person entering per household please. U.S. only. This giveaway ends at 11:59 PM EST on October 2, 2012. Disclosure: I was provided with product for the BEVERLY HILLS CHIHUAHUA 3 review. All views and opinions with regard to the products or the company are my own and were not influenced by the company. PAPI looks pretty darn cute. Papi is the cutest by far! I guess I’ll pick Chloe, I’ve never seen the movies but I believe she is the dog who started all of this. I think CHLOE is most adorable.